After three black women who were suspected of being burglars had police called on them, the Rialto police department release bodycam video to combat claims that the women were racially profiled. 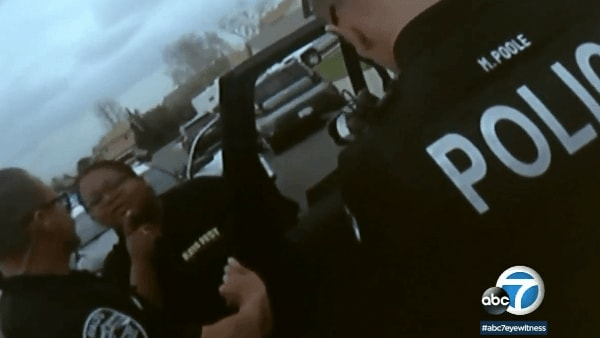 Three videos of police bodycam footage from the controversial incident were released to the public. The department maintains that officers responded “respectfully, honestly and professionally,” after a white woman reportedly called the police on the women she saw leaving an Airbnb home. After the women didn’t wave at the woman while they were leaving she called the cops, accusing the black women of being burglars. The women claimed that police surrounded them as a helicopter hovered above. “You want to laugh about this but it’s not funny,” said Kells Fyffe-Marshall in a Facebook post, adding that police told her the woman called 911 when they “didn’t wave to her as she looked at us” packing up. ABC7 reports that the Rialto police department is firing back and said the police joked with the woman and even allowed them to get out of their vehicles and make phone calls to tray and contact the owner to settle the situation. The exchange lasted 22 minutes. The homeowner said the situation could have been avoided if the women used common courtesy. “She walked over smiled at them and waved and they basically look at her like she was a martian,” said homeowner Marie Rodriguez to ABC7. Lt. Dean Hardin said it is standard procedure for a helicopter to be dispatched. Fyffe-Marshall, Donisha Prendergast, Komi-Oluwa Olafimihan are planning to sue the Rialto police department. The Police Department said they have received notice of pending litigation. Prengergast, identified herself to police as the granddaughter of singer Bob Marley. Airbnb officials reached out to the Mayor of Rialto and the Interim Police Chief to set up a meeting to discuss implicit bias and how not to target people of color after several black women were detained and accused of robbing a California vacation home. Watch the video footage here.